1) DO NOT HIKE ALONE. Go in groups, with adults supervising children. Make enough noise to prevent surprising a lion. A sturdy walking stick is a good idea. 2) KEEP CHILDREN CLOSE TO YOU. Lions are especially drawn to children. Keep children in your sight and control at all times. Talk to your children about lions and teach them what to do if they encounter one. 3) DO NOT APPROACH A LION. Most mountain lions will try to avoid a confrontation. Give them a way to escape. 4) STAY CALM. Talk to the animal in a confident yet calm voice. 5) DO NOT RUN FROM A LION. Move slowly. Running may stimulate a mountain lion’s instinct to chase. Instead, stand and face the animal. Make eye contact. Try to back away from the lion slowly. If you have small children with you, pick them up off the ground immediately if possible. Although it may be awkward, pick them up without bending over or turning away from the mountain lion. Sudden movement or fleeing behavior often triggers an instinctive predatory response. 6) DO NOT CROUCH DOWN OR BEND OVER. A person squatting or bending over looks a lot like a four-legged prey animal. 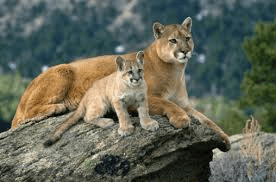 If you’re in mountain lion country, avoid squatting, crouching or bending over, even when picking up children. 7) DO ALL YOU CAN TO APPEAR LARGER. Raise your arms. Open your jacket if you are wearing one. Again, pick up children. Throw stones, branches, or whatever you can reach without crouching or turning your back. Wave your arms slowly and speak firmly in a loud voice. The idea is to convince the lion that you are not prey and you may be a danger to it. 8) FIGHT BACK IF ATTACKED! Since a mountain lion usually tries to bite the head or neck, try to remain standing and face the attacking animal. Many people have survived an attack by fighting back with everything from rocks, sticks, and bare fists to fishing poles. 9) PETS – Roaming pets are easy prey. Bring pets in at night. If they are left out, confine them in a kennel with a secured top. Do not feed pets outside as this attracts not only young lions but many small animals that lions prey upon. 10) DO NOT ATTRACT WILDLIFE, especially deer, into your yard by feeding or salting them. Encourage your neighbors to follow these simple precautions as well. The shape of a lion track is basically round, only slightly wider than it is long. The tracks have four teardrop-shaped toes, three distinct lobes at the base of the heel pads, and a bi-lobed leading edge of the paw pad. Lynx tracks overlap smaller lion tracks in size, and wolves or large domestic dogs overlap in size with larger lions. Neither of these species, however, displays the deeply three-lobed heel pads or the bi-lobing on the front of the main paw pad. Since the claws are retractable in cats, claw marks generally are not apparent in their tracks as they are with dogs and wolves. 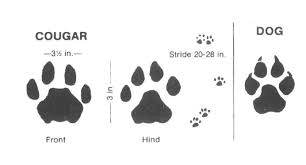 Large dog prints are rectangular in shape, have one lobe on the front of the main pad, and generally show claws.